We here at Virtual Workplace create new, innovative solutions which enable small and medium sized businesses to harness the power of the intra- and Internet. Continuity is a breakthrough in collaborative project management 2.0 software, fusing the best of social networks and business applications - allowing every organization to have their own professional online community. Continuity combines task tracking, scheduling, spreadsheets, word processing, on-screen notes, file exchange, information exchange - wikis/news/memorandums, and instant messaging. 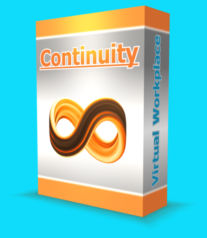 Continuity provides a secure, single point of exchange for all work related activity, protected by its powerful permission system. Continuity saves costs - creates a flat company structure and a lean production - by enabling the management team to directly track and supervise staff in real-time, establishing absolute clarity of what is required and by when. Continuity is scalable and fast, easy to set up and maintain, and adapts to any business process. Continuity enables the management and staff to fully collaborate - access and share all information in real-time - creating a unified, transparent company. Continuity provides all services staff require, enabling temporary or permanent staff to work from home or office - transparent to management or co-workers. "Continuity is an online communication, asset management and project tracking tool that is unlike anything I've seen before. It lies at the core of Binary Star's game design process and is a combination of Microsoft Project, Perforce, a file transfer tool, a chat program, an art pipeline approval process and much more."